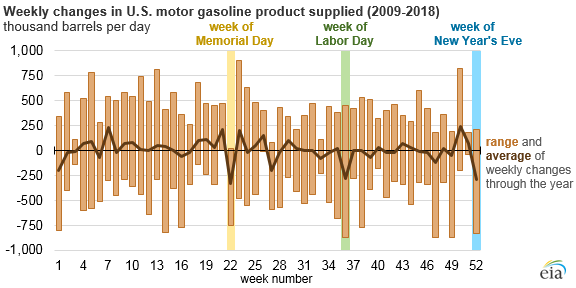 U.S. holiday weekends associated with increased driving, such as Labor Day and Memorial Day, often result in large swings or changes in gasoline product supplied. EIA uses product supplied as a proxy for U.S. gasoline consumption. Some of the largest weekly decreases in gasoline product supplied often occur during the weeks of these holidays, reflecting the timing of shipments to retail gasoline stations. 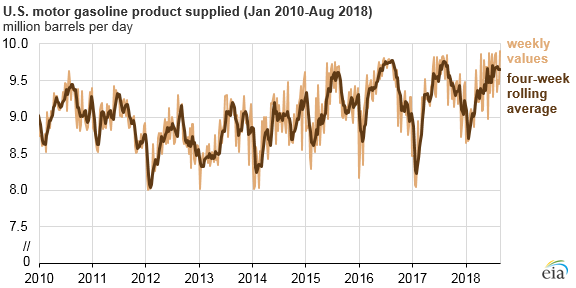 EIA’s estimate of product supplied published in the Weekly Petroleum Status Report measures the volume of petroleum products from the primary supply chain. Although these products are ultimately consumed, EIA’s product supplied series measures their volumes further up the supply chain and not at the point of consumption. For example, gasoline inventories at large bulk terminals are included in EIA’s measure of gasoline product supplied, but inventories at retail gasoline stations are not surveyed or included in this measure. For motor gasoline, the primary supply chain includes refineries, bulk terminals and blenders, importers, exporters, and pipelines. All of these primary supply chain components handle large volumes of gasoline on a daily basis. Retail stations are defined as secondary storage—the portion of the overall distribution network that falls between producers and end users. Product supplied captures the transfer of supplies from the primary supply chain to these secondary storage facilities. The existence of significant amounts of secondary storage means that these transfers between the primary and secondary supply chains can result in large week-to-week swings in product supplied that do not reflect actual consumption patterns. Because EIA’s survey measures the status of product in the primary supply chain as of Friday morning each week, many of the transfers from the primary supply chain (in particular, from bulk terminals to retail stations) occur before these holiday weekends, when stations prepare to serve the expected increase in drivers filling up their vehicles, and not in the week of the holiday itself. Other variables such as the timing and scale of imports or exports can lead to large weekly changes in product supplied that do not necessarily reflect actual gasoline sales volumes at retail stations in any given week. Because of these dynamics, EIA uses a four-week rolling average of product supplied, which can smooth out short-term fluctuations and highlight longer-term trends in gasoline consumption. Furthermore, gasoline consumption patterns should be considered within the context of other factors that can influence motor gasoline demand, such as retail gasoline prices, macroeconomic changes, and weather.